Trouble seems to be in store for senior deputy mayor Kamaljit Singh Bhatia who, along with four employees of the Municipal Corporation and three scrap dealers, have been issued court summons on a complaint filed by industrialist Jyoti Sarup for the alleged illegal demolition of a shop at Basti Guzan. The authorities at the local Civil Hospital seem to have given a quiet burial to healthcare services for the general public while remaining mired in serious controversies for the past one year on various serious issues. The Communist Party Marxist (CPM), Punjab, has flayed the Manmohan Singh-led United Progressive Alliance (UPA) and the Parkash Singh Badal- led SAD-BJP government for their “anti-public policies. Coming as a major reprieve, nearly 26 locker holders in the January 19 Punjab and Sind Bank Reru branch burglary case today finally got compensation from the bank authorities. A Jalandhar-based woman has alleged repeated physical and sexual abuse of her 15-year-old neighbour by the girl’s 32-year-old husband, based in Amritsar. Raju, a handicapped woman residing in the Gopal Nagar area, said her 15-year-old neighbour Sita (name changed) was married off to a 32-year-old Amritsar-based man by Sita’s aunt (father’s sister) Appo. The CIA staff of the rural police today arrested two persons with the recovery of 200 gm of heroin and a Zen car. CIA in charge Angrez Singh said the two arrested men were Jarnail Singh of Batala and Ishtpal Singh of Gurdaspur. The duo, coming from near Raipur Ballan village, were booked under Sections 21-61-85 of the NDPS Act at the Maqsudan police station. The police recovered Zen car, bearing number PB-08-AW-0639. Border Security Force Inter-Frontier competitions of boxing, gymnastics, judo, wrestling and weightlifting being organised by the Punjab Frontier BSF got underway today. With a choked, primitive art scene in Jalandhar, the heated debates about ‘truly’ avant-garde or indie art or design movements totally elude the city. In such a scenario, those willing to bring in a peak of design trends from other parts of the globe, to the city, need to be lauded wholeheartedly. Representatives of University of Nevada, ranked among top 200 universities, visited Lyallpur Khalsa College to hold formal discussions on collaboration in areas of academics, research and resource sharing. 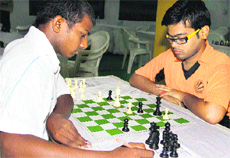 Delhi University beat Punjab Technical University by 3-1 on the third day of the North Zone Inter-University Chess Tournament 2013, being organised at the LPU campus, near here. Hundreds of people from all walks of life paid a tearful adieu to senior journalist Jasdeep Singh Malhotra at his funeral held at the Basti Sheikh cremation ground here today. Reacting to the tragic death of journalist Jasdeep Malhotra, Congress spokesperson Sukhpal Khaira has said the issue had brought to focus the two burning issues of public importance - political-mafia nexus running illegal mining and loss of precious innocent lives due to the road accidents. The court of JMIC Jaspreet Kaur has issued summons for November 15 under Sections 452 (trespassing), 166 (public servant disobeying law), 167 (public servant unlawfully engaging in trade), 427 (mischief causing damage), 382 (theft), 511 (offence punishable for life imprisonment), 411 (receiving stolen property), 414 (assisting in concealment of stolen property), 201 (causing disappearing of evidence), 506 (criminal intimidation), 148 (rioting armed with deadly weapon), 149 (unlawful assembly) and 120-B (criminal conspiracy) of the IPC against Bhatia, former Joint Commissioner MC Rahul Gupta, former Municipal Town Planner Hemant Batra, former Assistant Town Planner Dharam Pal and inspector Rajiv Rishi. Summons have also been issued to three scrap dealers Ashok, Bhatti and Sanjay, who had reportedly sold off iron gates and other stuff taken from the shop. The case pertains to a litigation filed by Jyoti Sarup, who owns Oriental Tools Corporation, a factory in the area. He has complained that in September 2009, Bhatia had illegally got a part portion of his property demolished using the MC machinery without the issuing of a notice under Section 269 of the Punjab Municipal Corporation Act 1976. The copy of the orders read, "The court is of the view that all the accused have exceeded their powers because they had no authority to do so. Therefore, there is sufficient ground to summon the accused to face trial for the offences under 13 sections. Hence, all the accused are ordered to be summoned to face trial for the offences under these sections." The judgment pronounced on September 9 (a certified copy of which was available today) further reads, "As far as offence under Section 388 of the IPC (extortion by threat) is concerned, the court is of the view that no ground is made out against the accused because there is no oral as well as documentary evidence on the file by the complainant to prove the commission of the offence. So the complaint against the accused qua section 388 of the IPC stands dismissed." The complainant has alleged, "During the illegal process, sewage and water connection of the premises were broken. The accused also broke open the doors of the establishment using welding arcs and committed theft of hand tools and finished goods." Though the district health authorities claim to have asked the hospital management to keep things in a perfect order, things are going from bad to worse. The hospital has been embroiled in various controversies like child swapping, use of unsterilised equipment in operations, alleged misbehaviour with patients, unavailability of drugs, shortage of staff, unskilled workers operating sophisticated machines, frequent transfers of doctors, especially medical superintendents, shortage of staff nurses, unhygienic maternity wards, labour rooms etc. Sources revealed that the interference of politicians and well-connected persons has further hindered the smooth functioning of the hospital. Moreover, a majority of the hospital staff is local and politically linked, which has been further affecting the healthcare services adversely here, it is alleged. Civil Surgeon Dr RL Bassan claimed that the controversies had brought a bad name to the hospital and said the issues were often discussed at the monthly meetings of the department. "I have already asked the medical superintendent to keep the things in a proper order and provide healthcare facilities to the patients while maintaining the ethics, irrespective of the fact that there is a shortage of staff," said Dr Bassan. The Communist Party Marxist (CPM), Punjab, has flayed the Manmohan Singh-led United Progressive Alliance (UPA) and the Parkash Singh Badal- led SAD-BJP government for their “anti-public policies”. In its “Jan Chetna” convention held at Desh Bhagat Yadgar Hall here today, CPM Punjab adopted a resolution focusing on the callous attitude of both the Central and the state governments towards the pressing demands of the people such as unprecedented inflationary pressure, rampant corruption and unemployment. The convention was presided over by a presidium consisting of Nazar Singh Saidpur, Trilochan Singh Rana, Bhim Singh Alampur and Gurnam Singh Sanghara. 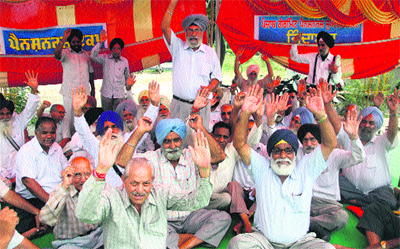 Leaders of the party including, its state secretary Mangat Ram Pasla, Harkanwal Singh, Raghbir Singh, Kulwant Singh Sandhu, Gurnam Singh Daud, Rattan Singh Randhawa, Dr Satnam Singh and Pargat Singh Jamarai addressed the convention and elaborated the demands as well as the next course of action. Bank officials distributed nearly Rs 3 crore to the claimants. There were 38 lockers which had been emptied in the eight-month-old episode. The 26 families were handed cheques of varying amounts, depending on the claim for the gold jewellery in each case. The compensation of other locker holders has been reportedly kept pending for they are living abroad. A few claimants who had been seeking return for cash, foreign currency or diamond jewellery stashed in the locker have also not been given reclaim. BS Khera, the man who had been leading various protests on part of the locker holders, said the bank had paid 60 per cent of the gold jewellery claimed by the locker holders, taking its rate for 22 karat on the day of the crime. The locker holders had been claiming compensation on the grounds that the bank had failed to take security measures, as there were no CCTV cameras installed and no security guards deployed in the bank. They said they felt quite relieved but they also blamed the city police for not being able to trace the culprits. Even the SIT formed to bust the robbery had been of no help, they added. There also had been much confusion over the submission of correct figures by the claimants. They had then been asked to furnish their claims afresh with attested affidavits. Asha Rani of Baba Deep Singh Nagar said she had not been compensated adequately. “I had lost 15 tolas of gold, but I was compensated with a Rs 2.3-lakh cheque, which is far too low,” she rued. Raju alleged that while the girl managed to escape from her home and came to Jalandhar after her repeated torture, her aunt’s family now threatens to take her away and hand her over to the same man. A complaint has been made at the police station No. 2 in this regard. “About a week ago, she ran away from her home and came to Jalandhar again and this time, her condition is the worst ever. Her husband and in-laws have abused her. When she came, she couldn’t even sit. She was drugged and repeatedly raped. Her stomach is also swollen. But her relatives threaten to take her away. If they take her this time, she wouldn’t survive,” Raju alleged. Raju and Sita’s brother alleged that they had started receiving threats that the girl would be taken away. Appo claimed that the girl is not 15, but 18 years old. 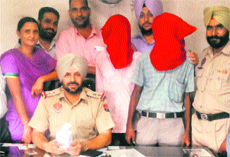 He said the duo had been into heroin trade for six months and had been getting it from Kapurthala. He said Ishtpal Singh's father was in a government job. Jarnail Singh had cases registered against him in Batala also. Border Security Force Inter-Frontier competitions of boxing, gymnastics, judo, wrestling and weightlifting being organised by the Punjab Frontier BSF got underway today. As many as 950 sportsmen of all the Frontiers of BSF are participating in the competition. The competition was declared “Open” by Rajdip Singh, Spl DG BSF (HQrs) Spl DG (West), Chandigarh during an impressive and colourful ceremony held at Ashwini stadium, BSF Campus, Jalandhar Cantonment. 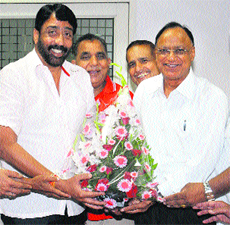 Olympian Ajit Pal Singh, who is Ex-BSF officer, was the guest of honour. The inaugural ceremony included impressive march past by the teams, oath ceremony, rifle drill, Lazium display and Bhangra by BSF personnel and students. The BSF boasted of having produced 17 Arjuna awardees in various disciplines. Besides, a number of the BSF sportsmen have represented India in various international competitions, said BSF DIG RPS Jaswal. He said as an elite central police force, the BSF laid an extra stress on games and competitions of different disciplines as a regular part of its day-to-day functioning. Inter Frontier Sports Competitions were organised as the force level sports tournaments where, potential young talents are selected to be put through intensive coaching at respective places of concentration under seasoned coaches. These competitions provide a healthy platform for BSF sportsmen to exhibit their rare talent and courage to be further groomed for national and international championships. 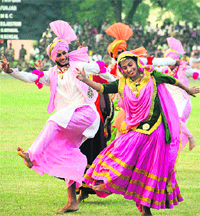 Impressive and colourful Khel Gaons have been created within the BSF campuses at Jalandhar, STC BSF Kharkan camp (Hoshiarpur) and the 67th Batallion of the BSF at Ramtirath (Amritsar) for participating sportsmen with facilities for boarding, lodging, recreation and entertainment as well as medical support. The ongoing competitions would conclude on September 27, said Jaswal. Apeejay College of Fine Arts, Jalandhar, organised International Design Week-2 in collaboration with Willem de Kooning Academy for Fine Arts and Design (WdKA), Rotterdam, Netherlands. Design Week-2, which is centered on the theme of “cultural transformation through design” commenced today, with an elaborate ceremonial start. It showcases how design has played a pivotal role in changing Indian culture and in affecting Indian sensibilities and Indian aesthetics over the years. Prof Maarten Regouin, former president, European League of Institute of Art (ELIA) is the chairperson and mentor of the Design Week and is accompanied by a team of talented faculty from WdKA, - comprising renowned graphic designer, Prof Renate Boere, artistic director and designer Bas Kortmann and Didactician Prof Paul Pos. Dr Sucharita, principal of the college and director of the workshop, welcomed Dutch design experts and viewed great promise in Indo-Dutch fusion. Kamna Raj Aggarwal, joint secretary, Apeejay Education Society, said Indians should be moored to their rich Indian roots, while exploring the new in other cultures. Prof Maarten said the most significant feature of culture to him is that it determines human behaviour. He informed Prof Paul Pos would be coordinating nine groups of the Design Week 2 with the nine groups in Rotterdam and together they would be working on a weblog. Architect Rajni Kumar, Assistant Prof in the Department of Design gave a presentation on the topic “Architectural Transformation: Design adjusts to the age of changing culture”. As many as 330 student participants have been divided into 27 groups, focusing on sub topics like minimalism, colour narrative, advancement, identity crisis, the treasure trove, changing scenario of Indian cinema, silence that speaks and unity in diversity. These groups will be mentored by Dutch and Indian design experts. The workshop will exhibit the relationship between cultural values and vernacular designs and the feasibility of these designs in contemporary scenario. During the week, students from the Department of Design, Applied art and multimedia have created exhibits on display in the college art gallery. Creations, on display, from interior design students, are: the sailing mist (couch on theme Kerala racing boats), the dancing Mudra (chair on posture taken from Bharatnatyam), the Royal Ecstasy (couch on Rajasthani moustache theme), Kolkata Riders (sofa with awning based Kolkata rickshaws) and contemporary Kantha (storage inspired from Kantha embroidery of West Bengal) among others. Principal Dr Samra welcomed guests and faculty members and informed that discussions for a coming together of these reputed pioneering institutions had been going on for some time, now. He appreciated the keen interest and efforts of the visiting Dr Everett Jackson and Sunny Kalia and extended to them all the support and cooperation. Dr Jackson gave a detailed presentation on the history and contribution of the University of Nevada highlighting the academic, research and other areas of mutual interest. HoDs of commerce, computer science, biotechnology, physiotherapy and engineering, gave presentations about their departments, sought and shared experiences with the visiting members. Everett Jackson informed the present members that the next and final round for culminating this initiative into signing of an agreement (MoU) will be held in America or here, as to the wish of the principal and the Management. Talented young and enthusiastic students of MGN College of Education won overall third trophy in GNDU Zonal Youth Festival for Education colleges held at University campus GNDU Amritsar from September 19th to 21. Students of the college Sunil Kapoor in Landscape & Clay Modelling and Gurpreet Singh in Rangoli stood the first. Hardeep Talwar in painting (still life), Simerdeep Kaur in slogan writing, Swati Sharma and Jaspreet Kaur in debate, Group Song team and Giddha team stood second. Amardeep Kaur Chhabra in poster making, Rama in sketching, Jaspreet Kaur in mimicry, Group Bhajan team and Quiz team stood the third. S Jarnail Singh Pasricha, secretary, MGN Educational Trust and principal Dr Amit Kauts, congratulated the participants, faculty members and incharges to bring laureals to the college. Students of Innocent Hearts College of Education, Jalandhar secured various positions in the zonal youth festival, Guru Nanak Dev University Amritsar. Harpreet Kaur stood the second in poster making competition and Jayati Kalra stood the third in poetical symposium. The managing committee, principal Dr DK Joshi, the faculty members congratulated the winners and encouraged all the participants. routed Kurukshetra University by 3-1; Himachal Pardesh University remained ahead of CCS University of Meerut by 3.5-0.5; and Lovely Professional University beat HNB Garhwal University by 3.5-0.5. Similarly, Jammu University beat CDLU Sirsa by 3-1; Lucknow University and DCRUST, Murthal tied with 2 each; Kumaun University, Nainital, subdued Chandigarh University by 3-1; and Dev Sanskriti Vishwavidyalaya crumbled DRML Avadh University by 2.5-1.5. The teams leading with full points are defending champion Delhi University and Panjab University with 6 match points each. Trailing them are Himachal Pradesh University, Shimla, and GNDU Amritsar with 5 points each. The LPU, Phagwara, PTU Jalandhar, Kumaun University Nanital, Punjabi University Patiala and Jammu and Kashmir University have amassed 4 points each. Lucknow University was in a losing position but managed to salvage a draw with DCRUST Murthal. Malhotra (41), Principal Correspondent with Hindustan Times, had died in a road accident at Milwan village near Mukerian yesterday. His mortal remains were taken in a procession from his residence at Model House to Model House Gurdwara before being consigned to flames. 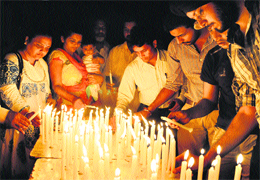 As Malhotra’s nine-year-old son Harnoor lit the pyre, all eyes turned moist. R Venkatratnam, Commissioner, Jalandhar Division, laid a wreath on behalf of Punjab Chief Minister Parkash Singh Badal. Deputy Commissioner Varun Roojam laid a wreath on behalf of Deputy Chief Minister Sukhbir Singh Badal. Suresh Arora, Chief Director, Vigilance Bureau, Punjab, laid a wreath on behalf of the Punjab Police and the Vigilance Bureau. KD Bhandari and Pawan Kumar Tinu, both Chief Parliamentary Secretaries, also laid wreaths on behalf of the Punjab Government. Mayor Jalandhar Municipal Corporation Sunil Jyoti also laid a wreath on the body. Journalists from various media groups also laid wreaths on the body. MP Mahinder Singh Kaypee, former Congress ministers Ch Jagjit Singh, Ch Santokh Singh, Amarjit Singh Samra and Avtar Henry, former MLA Jagbir Brar and vice-president of the Punjab Mahila Congress Nimisha Mehta also attended his cremation. Deputy Commissioner of Police Jaspreet Singh Sidhu, chairman of the NRI Sabha Jasvir Singh Gill, representatives of managements of various educational institutes, civil and police officers from various parts of the state were present in strength to pay their last tributes to the departed soul. The Divisional Commissioner and Deputy Commissioner shared their grief with his wife Kulwinder Kaur Malhotra and his brother Sandeep Singh Malhotra. Reacting to the tragic death of journalist Jasdeep Malhotra, Congress spokesperson Sukhpal Khaira has said the issue had brought to focus the two burning issues of public importance - political-mafia nexus running illegal mining and loss of precious innocent lives due to the road accidents. The redressal of these urgent people’s issues by the Badal govt would be the most befitting tribute to the fearless journalist, he said. He said Malhotra had highlighted the issueof a very well organised mafia network, blatantly indulging in illegal mining of sand and gravel and collecting Goonda tax, under the nose of the government. He had been vigorously pursuing the issue for the last many months and was inching close to his aim to expose the powerful political-mafia nexus causing great harm to our environment, besides the loot of public exchequer. Despite the loss of over 5,000 precious lives in road accidents each year in Punjab, the government remains unmoved and the issue of road related deaths is nowhere on the agenda of SAD-BJP government added Khaira.